This video is part of the appearance, “Private Storage for Cloud: Enabling Cloud Control“. 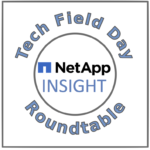 It was recorded as part of Tech Field Day at NetApp Insight 2016 at 9:30 - 10:30 on September 28, 2016. John Fullbright, Principal Public Cloud Architect, introduces NetApp Private Storage (NPS) for cloud and discusses how it can be used by enterprises to provide a consistent storage platform for moving some or all data to the public cloud. Also discussed are governance issues, performance characteristics, and best practices.